List of words relating to temperature. 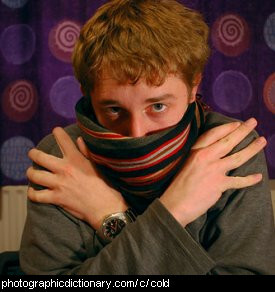 If you just want to see adjectives about temperature, go here. 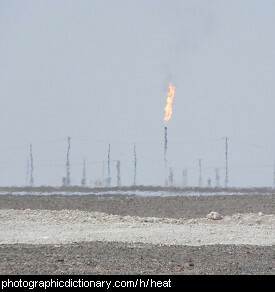 Something boils when it becomes so hot it changes from liquid to a gas. 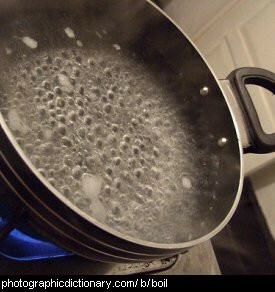 The picture is of some water boiling on a stove top. You can see the gas being made, in the form of bubbles in the water. People boil water so they can make soup or tea or coffee. 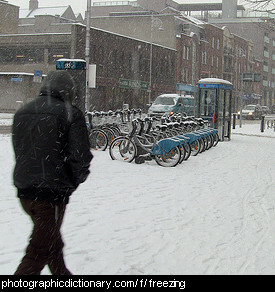 The weather can be described as chilly if it is briskly cold but not too cold. Not to be confused with chili. You feel cold when the temperature gets very low. It is cold in winter. The poor man in the picture is very cold, you can almost see him shivering. Ice and the inside of your fridge or freezer is cold. Airconditioners blow cold air during summer to keep you cool. Something is cool if it is comfortably cold. 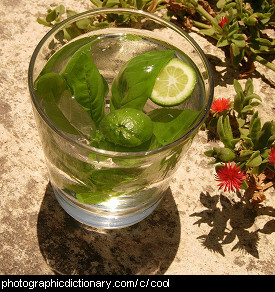 The picture is of a cool drink. Something that is popular, particularly with young people, can also be described as cool. 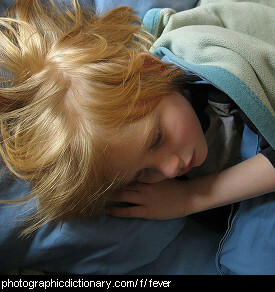 When you are very sick, you sometimes get a fever. When you have a fever you feel really bad, but the definition of a fever is that your body is much hotter than it normally is. When something liquid changes into a solid, the process is called freezing. We see the liquid water turn to solid ice all the time. Water turns to ice when it snows, hails, or when we make icecubes in the freezer. 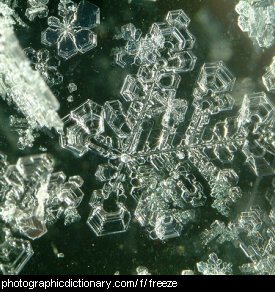 The photo is of some ice crystals forming as water freezes. You would describe the weather as freezing if it is extremely cold. 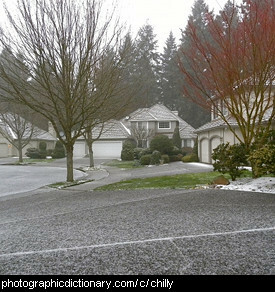 Frost happens when something gets cold enough for water in the air to freeze on it. 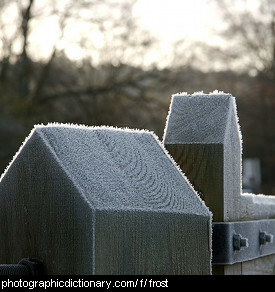 Frosts usually happen overnight, and in the morning there will be small ice crystals covering everything. Frost can kill many kinds of plants, especially young seedlings. Heat is something produced by something that is hot or a way of saying how hot something is, for example "feel the heat outside today", or "set the heat on the oven". You feel hot when the temperature gets high. It is hot in summer. Fire is hot, and food or drink that is freshly cooked is hot. It is very painful to touch something that is very hot, and it can leave you with a nasty burn. 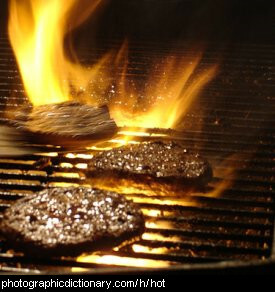 The picture is of some hamburger patties being cooked on a hot grill.